We made it from Half Moon Bay to San Diego in just under 4 days (440 nm). 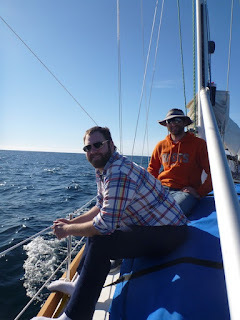 We left on Monday January 16th at around 10:00 am and arrived in San Diego on Friday January 20th at around 8:00 am. The trip started off a bit rough as Kyle vomited after about 15 minutes of sailing. He quickly retired to the cabin to sleep it off. We've discovered that if you are lying down with your eyes closed that you for some reason don't feel seasick. A quick sleep also somehow makes you feel better when you awake. I attempted to make tea, but just ended up spilling boiling water on myself. Luckily I was wearing my foul weather gear. After crawling around the cabin floor to clean up the water, I was feeling pretty seasick myself, so off to snooze-land it was for me. Captain Chris didn't seem to mind being the only one on watch because when I woke up I found him busting a move to a 90s dance mix in the cockpit. I think he was just super happy that we were finally heading south. The first day can really be summed up by Kyle and myself trying to manage our seasickness and Chris holding down the fort. The seas were lumpy and the winds strong. We were running under a reefed main alone. Day two can really be summed up by the word "DOLPHINS"! We had a huge (~ 100) pod of dolphins follow Starship for about 45 minutes. They came super close to the boat and loved to play in Starship's bow wake. They would tilt their heads and stare out of the water at you. Making eye contact with the dolphins was one of the most magical experiences of my life. One of the dolphins came so close to the surface that it started splashing it's tail vigorously and got Chris all wet. They are such playful creatures, or as Kyle says in the video, "they are the most excellent creatures". I know for me at least the dolphins really renewed my spirit. At this point in the trip I had only eaten about a granola bar, a fruit cup and a banana and was still feeling pretty queasy. Thoughts like "ummmm why are we doing this again….?" were floating through my brain as I wondered if my next snack would stay in my stomach. Experiences like the dolphins definitely make it all worthwhile. Listen carefully when you watch the video (Now with improved resolution). Can you hear the dolphins "clicking"? 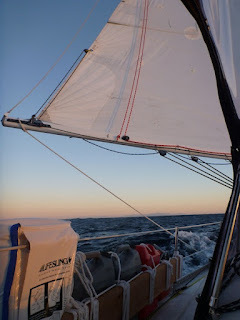 We also got to fly the spinnaker and I saw an amazing sunset on my night watch. Kyle and I both agreed that day 3 and 4 were the most enjoyable (at least for our tummies). We all seemed to get into the groove of things more. 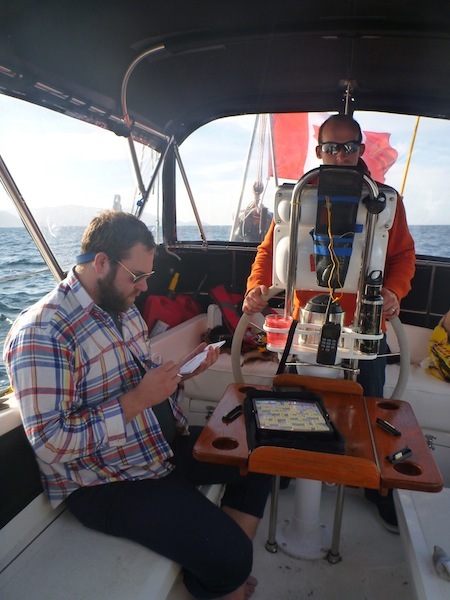 We had more great spinnaker flying days and some intense games of scrabble. Sailing by Catalina Island was beautiful. Here are some pictures I took of my last night watch as we approached San Diego. What a gorgeous sunrise. This is how we sleep! San Diego is a huge port. You don't want to get in the way of one of these guys. Here's a picture of our first meal on land. We were pretty pleased. Yay! We did it boys! Nice for our feet to be on land. San Diego's got some fine grass. We've got our Baja fishing license, a rod and reel, and a fishing book. I hope we catch a big one soon. The plan is to stay in San Diego for about a week and then head to Mexico. Starship is going to be hauled out of the water on Tuesday to have her hull re-painted with anti-fouling paint. For some reason, I'm very excited to live on our boat when she's out of the water. I'll definitely post some pictures. 1)I really like having a third crew member. The extra hands are super helpful and it allows everyone to sleep for 6 consistent hours (we do 3 hour shifts). Kyle you were awesome crew! You are so easy-going, a good listener and picked up the sailing quickly.Thank you so much for making the first leg of our journey a success. 2)Nobody (except for steel-stomach Chris) feels like eating spicy home-made chili on a passage. I need to make more bland pre-made meals next time. I'm thinking maybe plain rice or mac and cheese. Any suggestions? 3)I like being on night watch by myself.Somehow the 3 hour night watches passed by really quickly. Starring up at the stars or staring at the green glow of bioluminense in the water was enough to keep me completely fascinated. 4)If it's blowing a bit too hard and you think maybe you should take down the spinnaker. YOU SHOULD DEFINITELY TAKE DOWN THE SPINNAKER. Do not wait!!! We waited once and it was not a good scene. Luckily the spinnaker only has a very tiny (very reparable) rip.